Italy manager Cesare Prandelli has conceded that Spain will be the favourites when the two countries meet in Sunday's Euro 2012 final. The Azzurri beat Germany to set up a showdown with the tournament holders and 2010 World Cup winners. "I open my eyes but I'm still dreaming," said Prandelli. "There's great satisfaction here as everyone has put so much work into this. "But Spain will go into the game as favourites." He added: "They've been working on this for many years and have dominated every single contest. They are a brilliant side." 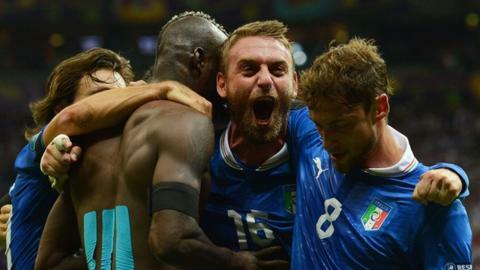 Italy have been the only team to score against Spain at Euro 2012, with the two teams playing out a 1-1 draw in their opening game of the tournament. "Spain have been criticised for being boring during this tournament but I think that is only because they are not playing exactly the way people want to see them play. That drives people to be critical, but I don't think the Spanish players deserve to get any negative comments." The Azzurri have impressed on their subsequent path to Sunday's showpiece and, despite speculation over his future as a result, former Fiorentina boss Prandelli insists he is focused on the final. "I've had my phone on and I've not had a call," Prandelli said, whose contract runs until 2014. "I've said before, I've got a great relationship with the Italian Football Federation and I love the shirt. "I do miss the everyday aspect of club football, of course, but that's as far as it goes."